on a stretch of semi-desert land about 5 airline miles from Alamogordo, New Mexico. at Alamogordo, New Mexico July 16, 1945. 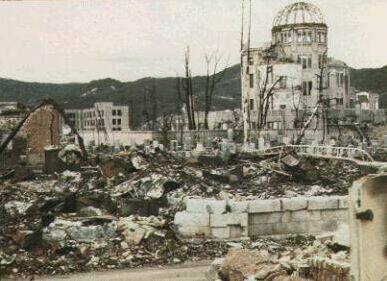 The atomic bomb dropped on the city of Hiroshima was code named Little Boy. The design is relatively simple using a gun type arrangement to explosively force a sub-critical mass of uranium-235 and three U235 target rings together at high velocity causing a chain reaction. 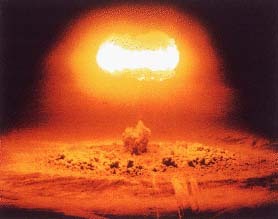 The atomic bomb dropped on Nagasaki was code named Fat Man and used plutonium as the fissionable material. Plutonium is a man-made element that is more efficient than uranium as a fission source. The design is also more complicated than the Little Boy atomic device. It relies on a rapid and simultaneous implosion of a fissionable shell into a critical mass. The quest for nuclear explosives, inspired by the fear that Hitler's Germany might invent them first, was an epic, top-secret engineering and industrial venture in the United States during World War II. The term "Manhattan Project" has now become a byword for an enormous breakneck effort involving vast resources and the best scientific minds in the world. The workers on the Manhattan Project took on a nearly impossible challenge to address a grave threat to the national security. From its beginning with Enrico Fermi's graphite-pile reactor under the bleachers of Stagg Field at the University of Chicago to the fiery explosion of the first atomic bomb near Alamogordo, New Mexico, the Manhattan Project took a little less than 3 years to create a working atomic bomb. During that time, the U.S. Army Corps of Engineers managed the construction of monumental plants to enrich uranium, three production reactors to make plutonium, and two reprocessing plants to extract plutonium from the reactor fuel. On August 2nd 1939, just before the beginning of World War II, Albert Einstein wrote to then President, Franklin D. Roosevelt. Einstein and several other scientists told Roosevelt of efforts in Nazi Germany to purify U-235 with which might in turn be used to build an atomic bomb. It was shortly there after that the United States Government began the serious undertaking known only as the Manhattan Project. Simply put, the Manhattan Project was committed to expedient research and production that would produce a viable atomic bomb. Over the course of six years, ranging from 1939 to 1945 more than 2 billion were spent on the Manhattan Project. A Massive enrichment laboratory/plant was constructed at Oak Ridge, Tennessee. The formulas for enriching and putting together the working bomb were created and seen to their logical end by some of the greatest minds of our times. Among these people who unleashed atomic power was Robert J. Oppenheimer. Oppenheimer was the major force behind the Manhattan Project. He literally ran the show and saw to it that all of the great minds working on the project made their brainstorms work. He oversaw the entire project from conception to its completion. Finally the day came when all at Los Alamos would find out whether or not The Gadget (code-named as such during its development) was either going to be the colossal dud of the century or perhaps end the war. It all came down to that fateful morning of midsummer, 1945. At 5:29:45 (Mountain War Time) on July 16th, 1945 in a white blaze that stretched from the basin of the Jemez Mountains in northern New Mexico to the to the still dark skies. The Gadget ushered in the Atomic Age. The light of the explosion turned orange as the atomic fireball began shooting upwards at 360 ft/sec, reddening and pulsing as it cooled. 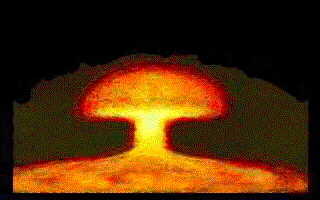 The mushroom cloud of radioactive vapor materialized at 30,000 ft. Below the cloud, all that remained of the soil at the blast site were fragments of jade green radioactive glass, .... All of this caused by the heat of the reaction. September 17, 1942 saw a new heading for the project. Colonel Richard Groves who had just gotten through as the overseer of the Pentagon’s construction was given control of the Manhattan Project. Within two days of becoming its head, Col. Groves ordered the purchase of 1250 tons of uranium ore that was stored on Staten Island and the following day purchased the 52,000 acres of land in Tennessee that would become the Oak Ridge installation. Later he would acquire the Hanford Engineer Works and 780 square miles of land in Washington State to begin construction of the plutonium reactors and separation plants. His next big step would be to ask Dr. Robert Oppenheimer to head the newly planned laboratory for the bomb’s design and construction at Los Alamos, New Mexico. With each of the three major locations of the Manhattan Project working around the clock, preparation and planning began to train flight crews in the delivery of the much-anticipated bomb. In August 1944 Groves made his first estimate as to the bomb’s availability and the Air Force began modifying seventeen B-29 bombers for delivery and placed Lt. Col. Paul Tibbets in charge of organizing the 509th Composite Group at Wendover Field, Utah. The 509th would ultimately be the group to deliver the bombs in combat and Tibbets would be the pilot of the Hiroshima mission. On April 12, 1945 President Roosevelt died of a brain hemorrhage in Georgia and Harry S. Truman became president. It wouldn’t be until the following day that Truman was finally apprised of the fact that atomic bomb research was not only going on but also well into the building stage. 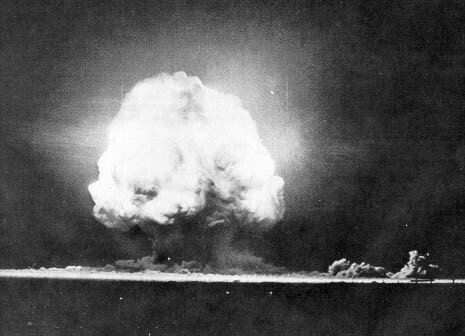 On July 16, 1945 at 5:29 a.m. the first atomic bomb (Gadget) was detonated at the Trinity Test Site with an explosive yield of 20-22 kilotons. It completely vaporized the steel tower, created a shock wave of intense heat that reached over ten miles, and the first giant mushroom cloud was seen for miles in every direction. The earthquake type of tremors the explosion caused were felt up to 160 miles from ground zero, the intense light was seen all the way into Albuquerque while windows were knocked out for a 120 mile radius. It was also on this day that the face of war would be forever changed as the years of research and construction bore fruit in the explosion of the first weapon of mass destruction. The first use of an atomic bomb against the Japanese would occur at Hiroshima, Japan on August 6, 1945 when the B-29 Enola Gay piloted by Col. Paul Tibbets dropped its cargo of “Little Boy” (uranium) upon the sleeping city below. 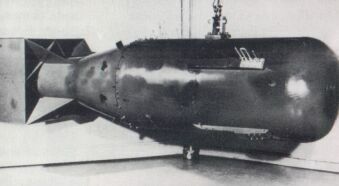 Following hard on the heels of this bombing, “Fat Man” (plutonium) was dropped upon the city of Nagasaki, Japan that in turn brought about a quick end to the war and the beginning of a new era in warfare. A sphere of plutonium no larger than an orange generates 18 kilotons of power. 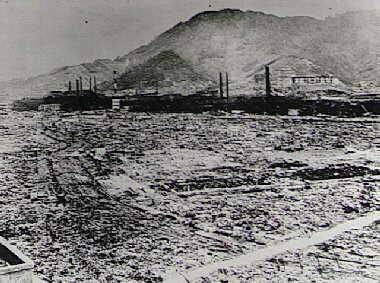 The bomb dropped on Nagasaki, August 9, 1945, unleashed 10 kilotons of energy, which is equivalent to 10,000 tons of TNT. 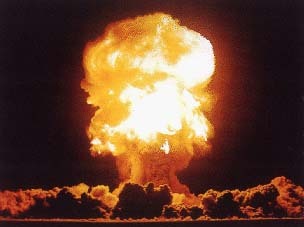 The Physicists working on the project said that that was only 1/10 of one percent of the bomb's potential total power. 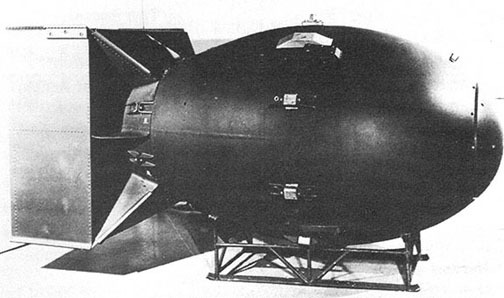 After the war the United States Strategic Bombing Survey estimated that it would take 220 B-29s dropping 1,200 tons of incendiary bombs, 400 tons of high-explosive bombs, and 500 tons of anti-personnel fragmentation bombs to approximate the damage done by the single atomic bomb used on Hiroshima. The 509th Composite Group was created under maximum secrecy with the specific purpose of dropping atomic bombs on Japan. The codename of the atomic bombing project was Silverplate. Fifteen B-29's were allocated to Col. Paul Tibbet's group, all Martin-Omaha modified bombers with an adapted bomb bay, Curtiss reversible pitch propellers, a British-built release mechanism (the same used to drop the gigantic 12,000 lb. "Tallboy") and no defensive armament except for the tail guns. Only fourteen reached Tinian, the fifteenth was left behind for unknown reasons. The group had its distinctive marking, a black arrow pointing forward enclosed in a circle, but soon in order to confuse enemy spies, spurious markings were painted on 509th CG tails. Col Tibbet's "Enola Gay" was given the encircled "R" of the 6th BG and Maj. Sweeney's "Bocks Car" that dropped the bomb on Nagasaki received false 444th BG markings.